It’s been a good year for Plot Points. After kicking things back into gear late last year, we’ve been busy! 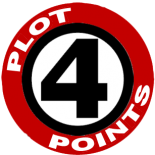 I’ve been negligent in my duties as Editor-in-Chief, but I hope to get back into working on Plot Points stuff in the future! You can see the stats for the blog, and how we’ve done below! Have a great 2016! Glad to hear it! I always have a tab open with this site up! LOVE Plot Points!! This entry was posted on December 30, 2015 by Mark in Uncategorized.